This role forms part of our client’s Elite APAC Services team and reports directly to the Senior Manager Consulting Services. 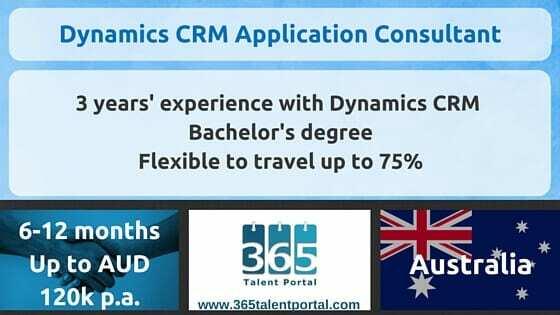 In collaboration with the Elite services team, the Application Consultant, CRM will act as a subject matter expert in the area of CRM, MS Dynamics, and Business Development Premier ensuring all assigned projects are scoped and deployed successfully. This is a 6 – 12 month fixed term contract. If you aren’t interested but know someone who might be, please note that for this role, we offer a referral fee if your recommendation leads to a placement. For more information about the conditions, contact us using the above email address.